How to set-off Short Term / Long Term CAPITAL LOSSES on Stocks, Property, MFs? You are here: Home / Tax Planning / How to set-off Capital Losses on Mutual Funds, Stocks, Property, Gold, Bonds & Debentures? Investments are subject to risks. All investments carry some degree of risk. Stocks, bonds, mutual funds, real-estate properties, gold, precious metals etc., can lose value, sometimes even all their value. However, most of us equate RISK with ‘losses’ directly. We forget the fact that it is only a probability of losing and not actually losing. We all want to make profits on our investments. No one wants to absorb the losses. What if you actually have to incur a financial loss? There can be times where your investments turn negative value and you have to book losses and move on. In such circumstances, is there any option to turn these losses into gains? Is it possible to maximize income by properly accounting for losses and lower your tax liability? What are Financial Assets & Non-financial Assets? What is Capital Loss? What is Capital Gain? What are different Heads of Income? How to set-off Capital losses incurred on sale of Stocks, mutual funds, property, gold etc., against the capital gains? How to carry forward Capital losses? 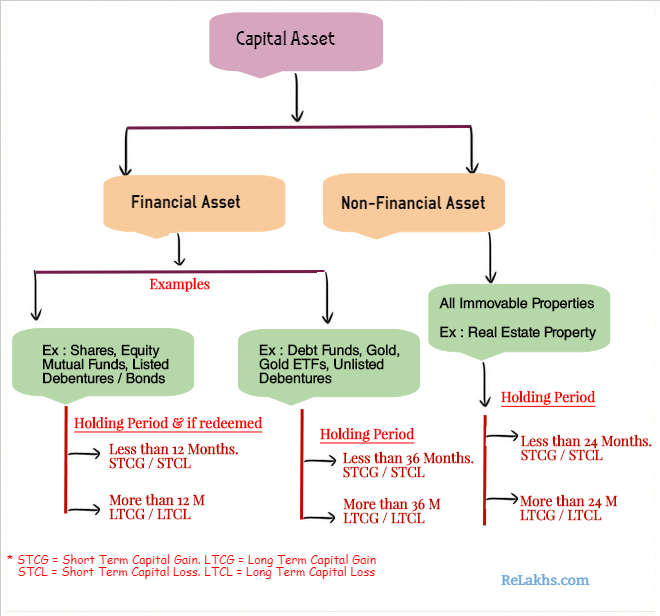 Capital asset typically refers to anything the individual owns for personal or investment purposes. It includes all kinds of property, movable or immovable, tangible or intangible, fixed or circulating. Capital assets are further classified as Financial assets and non-financial assets. Financial assets are intangible and represent the monetary value of a physical item. Stocks (Shares), equity mutual funds are examples of Financial Assets. What are Capital Gains & Capital Losses? If financial assets like Stocks & Equity mutual funds are held for less than 12 months then an investor will make either Short Term Capital Gain (or) Short Term Capital Loss on that investment. If a non-financial assets and some Financial assets like Debt Mutual Funds, Gold ETFs etc., are held for less than 36 month, investor will make either Short Term Capital Gain (or) Short Term Capital Loss on that investment. If a non-financial asset is held for more than 36 months then an investor will make either Long Term Capital Gain (or) Long Term Capital Loss on that investment. With effective from FY 2017-18 / AY 2018-19, the Holding period for Long term capital gains for all immovable properties has been reduced to 2 years from 3 years. How to set off Capital Losses? There cannot be a loss from salary and income from other sources. However, you could suffer losses under other heads of income such as loss from house property, business loss and capital loss. For example : If you make a loss on stock investment, you can not set-off this capital loss against your income from salary. The capital losses can be set-off against capital gains only. For example : If you make capital loss on stock investment, you can set-off this loss against capital gains on sale of property (if any). How to set-off Capital Losses on Stocks & Equity Mutual Funds? For example : If you had made a short term capital loss on Stocks and have a Long term capital gain on Sale of House property in a Financial Year, you can set-off losses on Stock investment against gains on Property. How to Set-off capital losses on Non-Equity mutual funds & Non-Financial Assets? For Example : If you have made a Long term loss on Debt Funds and have a LTCG on Equity Funds, you can not set-off the loss, as the LTCG on Stocks/Equity funds is a non-taxable income taxable income (w.e.f 1st April, 2018). Can I carry forward my Capital Losses to the next Financial Year? – Yes. If you can not set-off a capital loss under the same head during the same financial year, you can carry forward such losses to the next financial year and can be set-off against Capital Gains (if any) arising in the next year. A capital loss can be carried forward for 8 years from the end of the financial year in which the loss has been incurred. Do I need to file Income Tax Return to carry forward my Capital Losses? – A capital loss can be carried forward to the next year only if you had declared such losses in your ITR and the tax return is filed before the due date. How to set off Losses from Intra-day trading? 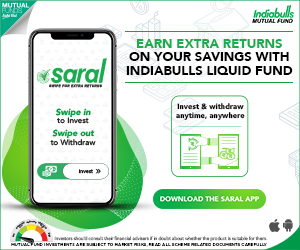 – If you have incurred speculative loses by doing Intra-day trading in Stocks, they can only be set off through speculative income and can be carried forward up to four years only. How to set off losses on Futures & Options trading? – Intra-day trading has been defined as ‘Speculative business’ whereas F&O trading is not. Income from trading in F&O (both intraday and overnight) on all the Stock Exchanges can be considered as non-speculative business income. Speculative (Intraday trading in equity) loss can’t be offset with non-speculative (F&O) gains, but speculative gains can be offset with non-speculative losses. If I have a Capital Loss & Capital Gains on various investments, what is the effective way of setting-off my loss? – Kindly note that there is no standard rule that the short-term capital loss has to be first set off against short-term capital gains before being set off against long-term capital gains. So, you need to look at the applicable tax rate on various Capital Gains and try to set-off your capital loss against the capital gain which has the lowest tax rate (also, do consider your income tax slab rate). Can I set off capital loss after receiving dividend from Stocks/Mutual fund Schemes? – To prevent tax avoidance through dividend stripping, capital loss set off is not allowed under Income Tax Act, if investment was made within 3 months of dividend record date or redemption was made within 9 months of the dividend record date. Different Asset Classes have different Tax Implications : How Returns are taxed? I am an investor and trade in equity & F&O. I understand that for turnover less than 2cr, the gain should be shown as 6% of this turnover to avoid tax audit. 1. I wanted to know that for checking applicability of tax audit, what does the “turnover” comprise of – Intra-day and F&O? 2. So, if have 50% of Intra-day turnover as profit but only 1% in F&O, the combined profit of Intraday and F&O should be 6% ? Or does it need to be atleast 6% in each? I had reported a short term equity loss of 1.35L in FY2016-17. This FY2017-18, even with 1.5L Short term gain in equity, my total income is below exemption limit. So can I carry forward the 2016-17 loss of 1.35L to next financial year FY2018-19 ? I believe that you can carry forward the losses. Also, suggest you to file your ITR for FY 2017-18/AY 2018-19 without fail. Thank you! appreciate your time. I had a net Rs 5,000 STCL (some gains – more losses) on debt mutual funds last financial year. I also had a LTCG of Rs 50,000 on equity mutual funds which, anyway, is not taxable. Can the STCL(on debt mf) be carried forward to future years or it must be first set off against the above stated LTCG (on equity mf). For FY 2017-18, LTCG on Equity funds is not taxable, at the same-time it can be used to set-off other losses. If you can not set-off a capital loss under the same head during the same financial year, you can carry forward such losses to the next financial year and can be set-off against Capital Gains (if any) arising in the next year. A capital loss can be carried forward for 8 years from the end of the financial year in which the loss has been incurred. But in next table of set off rule of STCL through property or non-equity fund you mentioned that STCL (non-equity fund,gold,property) can setoff only STCG through asset capital other than equity fund and stocks. Earlier I had updated this article as per the changes proposed in Budget 2018-19. But, I had forgotten to update the ‘second table content’. I have not updated it, thank you for letting me know this. Dear Saurabh.. I have updated the table as per the latest norms. Whatever dividen an unitholder recieves, it is net of DDT. That means DDT is not payable by the unit holder but paid by the Fundhouse. Once the dividend is paid by the fund house, the NAV of that scheme falls to that extent. Suppose you hold 1,000 mutual fund units with an NAV of Rs 20 and the fund house declares a dividend of Rs 2 per share. Since the dividend is coming directly from the NAV, the NAV will fall by Rs 2 to Rs 18. To prevent tax avoidance through dividend stripping, capital loss set off is not allowed under Income Tax Act, if investment was made within 3 months of dividend record date or redemption was made within 9 months of the dividend record date. Dear Srikanth, this FY2017-18, I will have STCG of rs.500000/- in shares. But I incurred STCL of rs.150000 last year. I did not mention that loss in ITR 16-17 for set off to this year 17-18. Can’t I effect that loss in this current ITR? As per Income Tax Act short term loss can be carried forward for 8 successive assessment years commencing from the assessment year in which the loss was computed/incurred.However, the income tax return has to be filed in time by disclosing the loss. If the ITR has been processed, kindly check if there is an option to revise your ITR. If so, take help of a CA and revise it by including the losses. Suppose I have LTCG of Rs.50,000 on one stock and LTCL of Rs.10,000 on another stock during the same year. what would be the figure I need show in EI schedule of ITR-2. The LTCG of Rs 50k has to be reported under EI schedule of ITR. Thanks Srikanth, So this means Long term capital gains of various stocks have to be added and shown in EI schedule of ITR-2 but not Long term capital losses on various stocks. So, LTCL won’t find any mention in ITR-2 even in the form of deduction from the LTCG even if incurred during the same year. thanks once again. Kindly note that LTCG is just reported under EI section. The normal assumption is that LTCG on equity mutual funds or shares is tax-exempt (where STT is paid) and at the same time LTCL on these can not set off. This assumption is made by many of the CAs/auditors/tax-assessees. Regarding the Mutual Funds of HDFC and DSP , ICICI and Franklin (Exchange Traded) if they are held for a period more 12 Months then the Capital Gain will be long Term and the same is not taxable. Well my above statement is 100% as per law or there is any deviation in the Law. Please give clarity to my above question . There is no tax on LTCG on index based ETFs. However, Gold ETFs are treated as similar to debt funds. Went through your mails and responses, well you are doing a great job. Guiding the people on the Financial planning and Tax related issues. 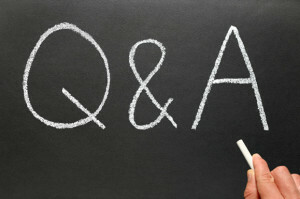 My question is regarding the sale of Land ( capital asset) post 5 years of Acquisition. It will attract long term Capital Gain Tax @20% , but benefit of indexation is available of Acquisition cost ,development cost , legal cost, travelling cost pertaining to sale. But development cost pertaining to boundary wall ,filling cost and motar pump cost. How can it be claimed as the payment was made in cash four year before. Could you please advice or substanciate how to claim the benefit of the expenses on development. The onus of justifying the claim for cost of improvement lies with the Tax assessee (in case a scrutiny is raised by the IT dept). Legally, a tax assessee is expected to maintain relevant bills to make the claim. He/she might have paid in cash, but the bills should be there reflecting the cash payment to respective individuals. I have purchased a flat in Jun 2016 at 45 lakhs and selling it in Oct 2017 at 70 lakhs. This money I want to use it to buy a new flat at 75 lakhs near my place of work. Am I required to pay short term capital gains tax? Dear Raghavendra ..Yes, Tax on STCG are applicable as per your income tax slab rate. Kindly read : Taxes on Capital gains on sale of property..
SIR BUT INVESTING PROCEEDS OF AN HOUSE PROPERTY IN ANOTHER HOUSE PROPERTY IS EXEMPT U/S 54 OF TAX ACT. Dear venkatkrishnan .. Yes, but that for Long term capital gains only. Related Article : How to save capital gain taxes on sale of property? Hello,my Stcl is 10000 and STCG is 86000 so i have to pay tax on only 76000. Is it right ? Bcoz my CA is asking me to pay on 86000. He said i cannot setoff my losses. Both loss and profit figures are from positional equity cash positions. No intraday. Please advise. I believe that STCL on stocks can be set off against STCG or LTCG of any capital asset except Stocks/Equity mutual funds. In FY 2016-17 I have Short Term Loss from Shares and Also Short Term Gain from (Intraday) Speculation Income. So Can I Set Off each Others in the FY 2016-17. I the above example treatment Correct..?? Please Explain it….!! Dear Navin.. If you have incurred speculative loses by doing Intra-day trading in Stocks, they can only be set off through speculative income and can be carried forward up to four years only. In your article you say that LT capital losses from equities are a dead loss and cannot be offset against any other LT capital gains. Can you recheck that please? If you look at the case in this link ( https://goo.gl/LSXU52 ), the tribunal has held that long term capitall losses can be set off against other long term gains, long term capital gains from sale of land in this case. I am assuming this would mean that I can offset my LTC losses fro equities against LTCG from debt mutual funds, gold etc. too. How do I verify if this assumption is correct? This assumption is made by many of the CAs/auditors/tax-assessees, as there is no clear cut details on the same. However, as pointed out by you, in of a court judgement (Mumbai court tribunal) has given a verdict that a Tax assessee can set off LTCL on shares/Equity MFs with other LTCG on land/Gold/other capital assets. I had a STCL of Rs.5000/- during the FY 2015-16 which was C/F to FY 2016-17/ Suppose if I have a STCG of Rs.3000/- should it be compulsarily adjusted against the above loss because in this current FY after taking into account the above STCG of Rs.3000/- my total income is coming below the taxable limit (after adjusting the deductions under sec 80 C) or shall I adjust the entire STCL of Rs.5000/- during the next FY. I had posted the above two days back and I shall be thankful if you kindly reply me. Dear KRISHNAN ..You have the option to C/F to future FYs. I was wondering if you plan to write about IPO, their pros and cons and why one should invest/not invest in? Looking forward to hear from you to understand in layman language. Dear Prem ..I generally do not touch topics related to direct Equity. But, will surely try to write on IPO. Great article Sreekanth! you have described all the concepts in very nice way. simply yet thoroughly written and easy to understand. Thanks for sharing. Incredible Blog! The way you describe this blog are really nice. This is the good information about this how to set off capital losses on mutual funds, stocks, property, bond etc. Thanks for sharing us. Bro! your just awesome! Simply the best. I am An NRI From UAE.My only income in India is rental income which is around 7,50,000Rs per annum. Can u clarify whether i need to pay tax at 30 percent or any deductions are possible. You can claim 30% standard deduction on rental income and you may fall in 20% tax slab rate. You can set-off current year losses with current year capital gains, in Section – E of ITR (” Set-off of current year capital losses with current year capital gains”). In the above case, Rs 2,000 can be carried forward to next FY under Schedule CFL of ITR. You can get it from your Distributor/Agent/Online platform provider/Mutual Fund house/Registrar (like CAMS/Karvy).